During a family portrait session my clients are not the only ones that can be found laying in the grass. You will typically find me up and down many, many times and often laying down on the ground to get that perfect photograph. Sometimes being down on the ground comes in handy when a child decides to lay in the ground and roll around. 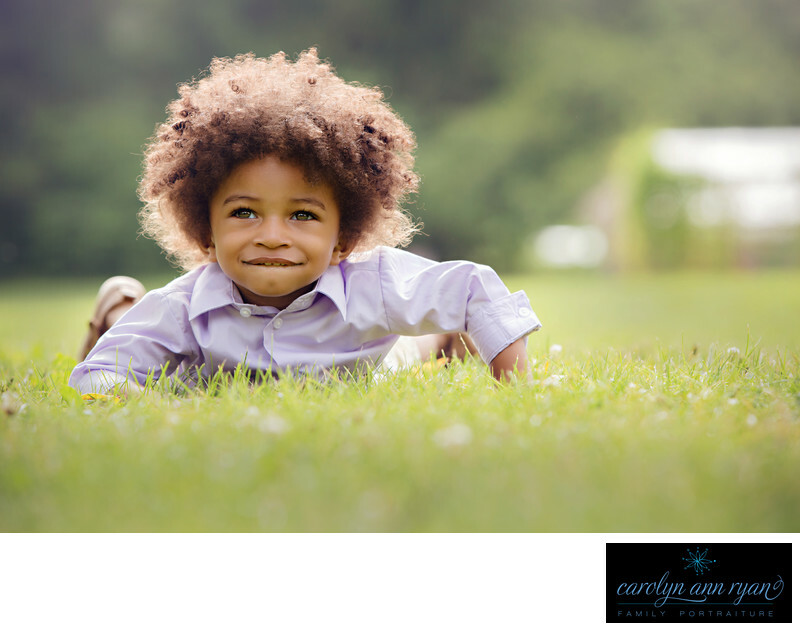 How I adored this sweet little boy during this particular portrait session. He had these sweet and soulful eyes that was the perfect complement to his hair and smile. And let me tell you, his mom has wonderful fashion sense. I just loved his purple button-down shirt, shorts and shoes. I think he stepped right out of a catalog. If not, he certainly should be in one. Don't you agree?Keywords: boys (120), curls (48), lavender (9), purple (24), Summer (69), toddler (39), toddlers (45). 1/250; f/5.0; ISO 160; 153.0 mm.